First edition first print hardback of A Walk Down Elm Street with the Man of Your Dreams published by Aurum Press Ltd in 2009. Signed by Englund on a bookplate attached to the half title page. Full numberline: 1 3 5 7 9 10 8 6 4 2. Forbidden Planet 'Signed' sticker to front cover. 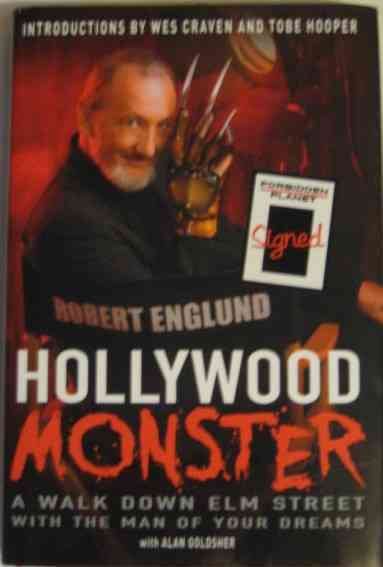 First edition first print hardback of HOLLYWOOD MONSTER (A Walk Down Elm Street with the Man of Your Dreams) by Robert Englund and Alan Goldsher (Introductions by Wes Craven and Tobe Hooper) and published by Aurum Press Ltd in 2009. Signed by Englund on a bookplate attached to the half title page. Full numberline: 1 3 5 7 9 10 8 6 4 2. Forbidden Planet 'Signed' sticker to front cover. The book is in very good condition (red cloth boards with silver lettering to spine) with light bumping to the edges and corners. The book is in a very good+ unclipped dust jacket which has light creasing here and there, couple of scratches to back cover. Internally the pages are clean and tight and there are no tears or other inscriptions. When Robert Englund first appeared as the ghoulish Freddy Krueger in 1984's box office smash, A Nightmare On Elm Street, he knew he'd created something special. Little did he suspect with seven sequels and a TV series yet to come that Freddy would become the horror icon of the 80s, and Robert Englund the cult star of one of the most successful franchises in film history. 298 pages including Epilogue, Afterword, Appendix 1-5 and Acknowledgements. Illustrated with black & white and colour photographs.